Western powers have expressed dismay at Israeli plans to build 1,100 more homes on the edge of Jerusalem. The US Secretary of State Hillary Clinton called the move "counter-productive" to peace talks while the EU said the plan should be "reversed". The announcement comes days after Palestinian leader Mahmoud Abbas called for full UN membership for a Palestinian state. The new houses are to be constructed at Gilo, in East Jerusalem. US-brokered peace talks between Israel and the Palestinians are deadlocked over the issue of Jewish settlements in the occupied West Bank and East Jerusalem. 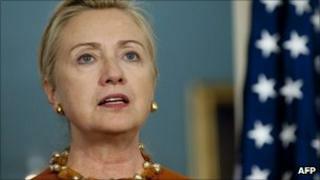 Mrs Clinton said Israel's move would damage attempts to resume direct negotiations with the Palestinian Authority. "We have long urged both sides to avoid any kind of action which could undermine trust, including, and perhaps most particularly, in Jerusalem, any action that could be viewed as provocative by either side," she said. The European Union's Foreign Policy Chief Catherine Ashton told the EU parliament that she heard "with deep regret" that Israeli settlement plans were continuing. "This plan should be reversed. Settlement activity threatens the viability of an agreed two-state solution and runs contrary to the Israeli-stated commitment to resume negotiations." She said she would raise the issue with Israeli Prime Minister Benjamin Netanyahu when she next met him. "He should stop announcing them and, more importantly, stop building them," she said, adding that it was wrong to get people to live in a place from which they may have to move from after any negotiated settlement is achieved. British Foreign Secretary William Hague too urged Israel to revoke its decision. "Settlement expansion is illegal under international law, corrodes trust and undermines the basic principle of land for peace," he said in a statement. The plan for construction in Gilo includes the construction of small housing units, public buildings, a school and an industrial zone, according to the Ynet news website. "It's a nice gift for Rosh Hashanah [Jewish New Year]," Yair Gabay, a member of the Jerusalem planning committee, told Ynet. The chief Palestinian negotiator Saeb Erekat said the decision represented a rejection of a proposal by the Quartet of Mid East negotiators - the US, the EU, Russia and the UN - for new talks between the Palestinians and Israelis, expected to be made officially on Friday. "With this, Israel is responding to the Quartet's statement with 1,100 'NOs'," he said. On Monday, a divided UN Security Council met behind closed doors for its first discussion of last week's Palestinian application for full state membership of the UN. The request needs the support of nine of the 15 members of the council, but the US has said it will veto the bid. Israel built the settlement at Gilo on land it captured in 1967. It later annexed the area to the Jerusalem municipality in a move not recognised by the international community. Israel says it does not consider areas within the Jerusalem municipality to be settlements. Gilo lies across a narrow valley from the Palestinian village of Beit Jala. It became a target for militants during the second Palestinian uprising against Israeli occupation in 2000. Meanwhile, the UN rapporteurs on housing, water, sanitation and food rights said there had been a "dramatic increase" in the demolitions this year. "The impact and discriminatory nature of these demolitions and evictions is completely unacceptable," they said in a statement. "These actions by the Israeli authorities violate human rights and humanitarian law and must end immediately."